Making significant changes to any organization is a process that needs to be managed carefully. It can cause disruption to the business and confusion among employees if it isn’t managed appropriately. When upgrading your technology platforms to use Oracle technology, communication and training are essential to help the transition go as smoothly as possible. ArcLight Consulting is one of the only Oracle partners that offers an in-house Change Management practice to make the adoption of Oracle products easier. The aim is to communicate the benefits of the changes taking place, train staff in the use of new tools and understand how to measure the benefits and results, among other things. There are various reasons that change management is necessary when upgrading to Oracle cloud technology and other products. Creating a strategy for change helps to eliminate risk by examining the things that could wrong and creating a plan to avoid them. Preparing for the changes can also involve managing expectations so that everyone knows how the new technology both will and won’t affect the company. It can help to contain fears about any negative impact that might occur and communicate the benefits that the changes will have. Preparing the organization to adopt the new technology creates a smoother transition so that the changes can deliver their benefits more quickly. Training is one of the key ways to manage change and can involve analysis of needs, as well as design and delivery of training programs. Employees should receive the help that they need to change how they work and manage how the new technology affects their jobs. Change management can also involve recognizing and measuring the benefits and results of the changes. It’s important to be able to show that the changes are worth it and have offered a net benefit to the organization. To successfully manage change, organizations need to have a strategy in place. 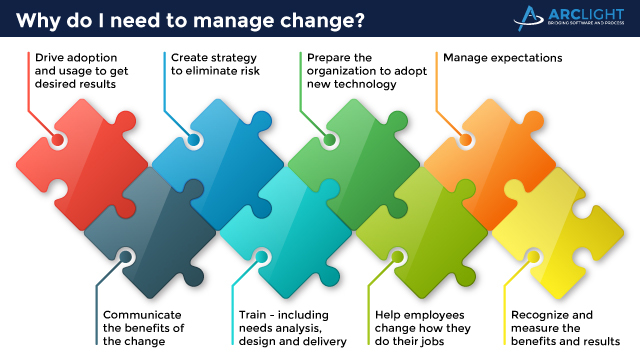 Change management should begin with assessing the organization’s readiness for change to determine what needs to be carried out before any changes, when the changes begin and after the new technology is in place. Communication is essential during these changes, which is why ArcLight Consulting’s Change Management service includes branding and consistently messaging your project to keep your team engaged from start to finish. A consistent communication plan ensures your team is aware of what’s happening at all times and keeps employees engaged and informed. Managing risk and reducing resistance to the changes helps to get everything in place without unnecessary problems. It’s best to take stock of any potential risks and work out how to minimize them before starting to make any changes, rather than having to correct any errors later. Change management can help to maximize end-user performance by ensuring everyone has the correct training and that your whole team is aware of how they can make the most of the new technology. Change management is an important part of adopting new Oracle technology. Get it right with a good change management strategy.